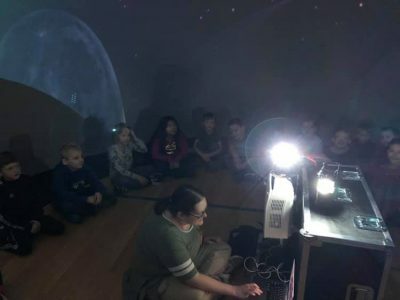 The State Library of North Carolina, in conjunction with the Department of Natural & Cultural Resources state-wide celebrations of the 50th Anniversary of the Moon Landing in July of 2019 and to help gear up for summer reading at the public libraries, purchased 4 Starlab portable planetariums. 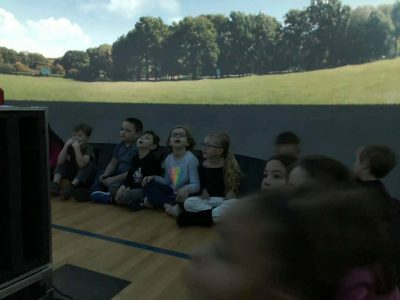 Portable planetariums were available this year to public library systems on a loan basis. 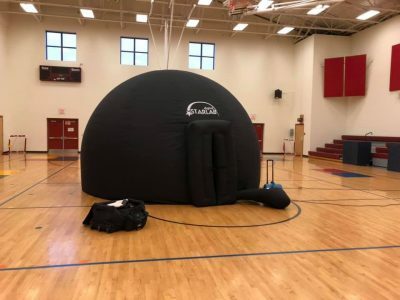 A StarLab portable planetarium is exactly what the name suggests; it is an inflatable 21 feet circumference planetarium that uses a projector which displays images and videos within the dome. The software the library is using deals primarily with astronomy, along with some mythology. All of us here at AMY Regional Library are incredibly grateful to the State Library for making this equipment available for our 3-county system. Meredith Hayes conducted many tours in Avery County. Because the dome would not fit on site at Avery Morrison Library, Meredith traveled to the rock gym and area schools to present tours. That is no small feat with all that equipment involved, so we are glad she was so enthusiastic to bring it to the kids.